The idea is that as you travel from one repeater’s coverage to another, much like cellphones do, the HT or Mobile radio will automatically change to the new repeater frequency and maintains the same Talk Group and thus QSO. N1ATP repeaters are a combination of Motorola and Hytera. The system is really cool. By programming a Motorola or Hytera HT or Mobile by Talk Group and a roam list the radio switches frequencies accordingly to maintain the same talk group. Knut uses this method as he travels between his two repeater’s coverage. With this said, the radio must have roam capability. The “$100” TYT MD380/390 level of radios do not support, only the more expensive radios. In Connecticut, a statewide ARES system has been implemented with this capability. In theory, a user can simply turn on his Motorola or Hytera radio and select a Talk Group and the radio will automatically figure out which repeater to use. 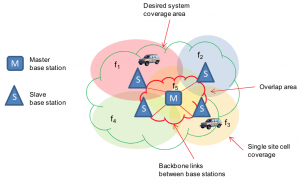 A commuter who travels through several repeater’s coverage could have an automatic switchover between the sites. No need to run out of coverage, then switch Zone and Channel to match up to the next repeater’s frequency etc. I am sure you have heard that guy who disappears for a few and comes back to explain why he was gone. I have used the feature during Public Service Events where I travel back and forth between the Start Area and Finish Area repeater coverage. Much simpler than manually changing channels or “flipping” to the fill-in X-Band repeater commonly used in events. Roaming is seamless to the user, much like a cellphone system. The YouTube video presents an event where balloon chasers are remaining on the same TG while automatically switching between 3 repeater-sites as they are chasing. All without touching the channel selector….. The better part is towards the end of the movie. Create a channel with the correct CC, TS and TG for each repeater you will be traveling between. Make sure IP Connect is checked. This will only work with “real” DMR Repeaters which has IP Connect like a Motorola XPR or SLR series or Hytera RD series. It will not work with hotspots and most home-brew repeaters. Add the channel in the same way as a scan list, however as a TG specific roam list. Name the roam list the TG, E.G. : TG3100. As you move and loose one repeater, the radio will switch to the next repeater in the roam list with adequate signal (usually better than -108db) while your main on the same talk group. Your radio will actually ping the repeater and log on (register). The difference between scan and roam is that Scan keeps scanning until a signal is received, while a roam radio checks in with the repeater in the roam list and remains locked on that channel until the signal is too weak. I have personally maintained the same QSO while traveling from southwest Connecticut up north through the state never really knowing which repeater I was on. This is not totally true since the radio display will tell you based on your naming convention of each channels. Point is, it is very much like a cellphone. It just works when the repeaters have some overlapping coverage! It also conveniently works as you travel from one coverage to another. Again, the difference is from scan is that the radio registers with a usable repeater on a TG as you specify. A Mobile Hotspot can kind of accomplish the same thing provided cell data coverage is seamless. Through Brandmeister both worlds can be combined for max flexibility. They both have independent advantages. Since I don’t have access to prime repeater locations (mountain peaks or tall towers), I can place the repeaters at a more moderate elevation and re-use the frequency pairs in cells like a cellphone system. Takes more hardware which may still be easier than getting access to the prime locations. This also simplifies temporary event repeater kits which may connected together with cell data modems for ad-hoc use. I Love The Roaming Feature! I don’t like home-brew repeaters which do not employ standard DMR Tier 2 options!